Yale University, the University of Bridgeport (UB), and Housatonic Community College (HCC) will celebrate the culmination of the Helmsley Postdoctoral Teaching Scholars program with a capstone symposium on Friday, April 6 from 2 p.m. to 4 p.m. at Yale’s Center for Teaching and Learning (CTL). The three institutions have worked together as part of the grant-funded initiative to improve education in the region for undergraduate students. “The Helmsley Postdoctoral Teaching Scholars program has demonstrated how regional institutions can collaborate to improve learning experiences for students in science, technology, engineering, and math (STEM) disciplines,” said Jennifer Frederick, executive director of Yale’s Center for Teaching and Learning and principal investigator of the grant. “Our team has collected evidence showing that faculty members who perceive support from their institution implement change and improve STEM education at much higher levels. The common barriers of time and funding can often be overcome by supporting teaching through recognition, open conversations, and sharing resources,” Frederick said. The capstone symposium, funded by the Leona M. and Harry B. Helmsley Charitable Trust and Bruce and Julie Goldsmith, provides an opportunity to learn from the programs participants. 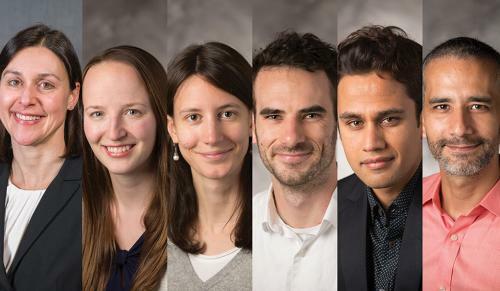 Marco Bonett-Matiz, Claudia De Grandi, Savan Kharel, and Brett C. Smith, all Helmsley Postdoctoral Teaching Scholars and postdocs at Yale, will share their teaching innovations from introductory STEM classes at Yale, UB, and HCC. To learn more about the Helmsley Postdoctoral Teaching Scholars program, register to attend the capstone symposium. Space is limited.